From the very beginning, Main Street, as its name suggests, was the heart and soul of the town of St. Anthony. Throughout the 1850s, Main Street property owners, using their wealth from sawmilling, replaced their simple wooden buildings with brick and stone ones. By 1855, the street was a substantial commercial district, home to four hardware stores, three dressmakers, two jewelers, four physicians, two hotels, three land agents, two bookstores and two daguerreotypists. 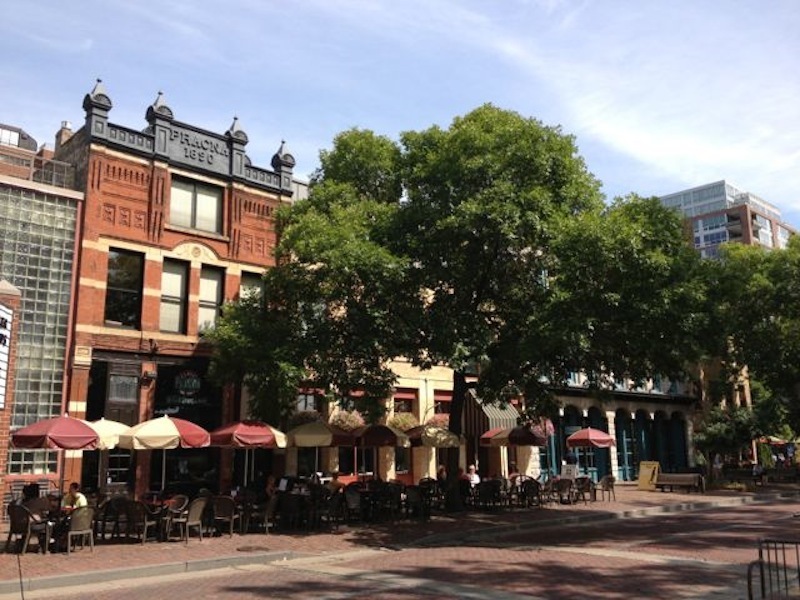 The buildings featured here are in the 100 block of Main Street and were built between 1855 and 1890. 117 Main Street SE was originally home to a wood-frame tavern owned by Bohemian native Frank Pracna. When the tavern burned down in 1889, Pracna hired Minneapolis architect Carl Struck to design a 2½-story brick tavern in its place. Pracna operated his saloon downstairs, and his family lived upstairs until 1909, when they sold and moved to Los Angeles. The building, which showcases the Queen Anne commercial style of architecture, features a corbeled table below an elaborate metal cornice topped with four turrets. 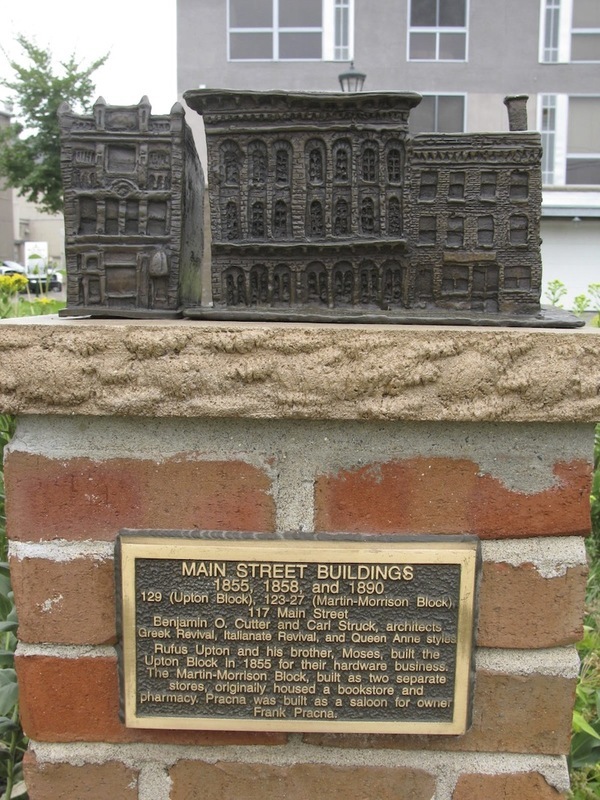 The three-story Martin and Morrison Blocks at 123-127 Main Street appear to be a single building but are, in fact, two separate buildings. Both are built of Platteville limestone. Captain John Martin, a 35-year-old steamboat captain from Vermont, came to St. Anthony in 1855 and began constructing the first building in the spring of 1858. Fellow Vermonter, Frank Morrison, arrived about the same time and soon announced his intention to build a store next door, “similar to the beautiful design” of his neighbor. Morrison later became president of the Mississippi Bridge Company, which built the nation’s first bridge over the Mississippi River. The first tenants to occupy the elegant buildings were bookseller John Hechtman and druggist William F. Cahill. 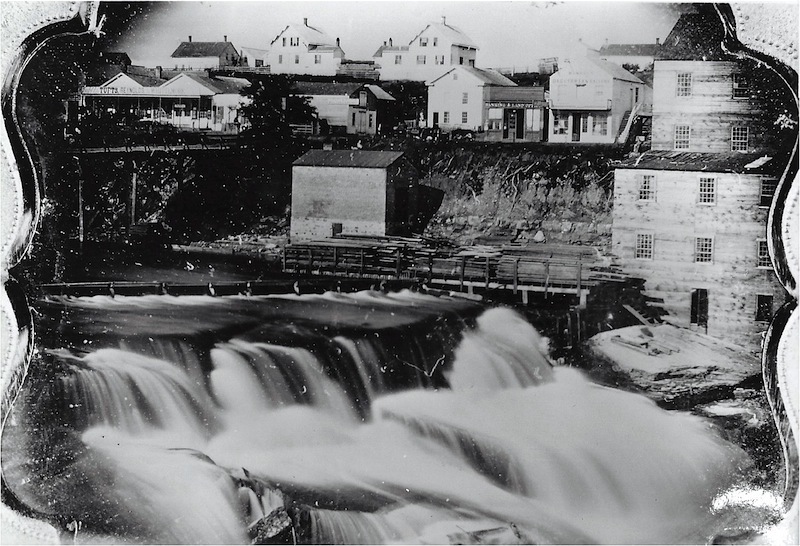 In later years, the buildings housed the Minnesota Republican and the St. Anthony Falls Weekly Express, which is why the buildings were often referred to as the News Block. 129 Main Street SE is apparently the oldest commercial masonry building still standing in Minneapolis. 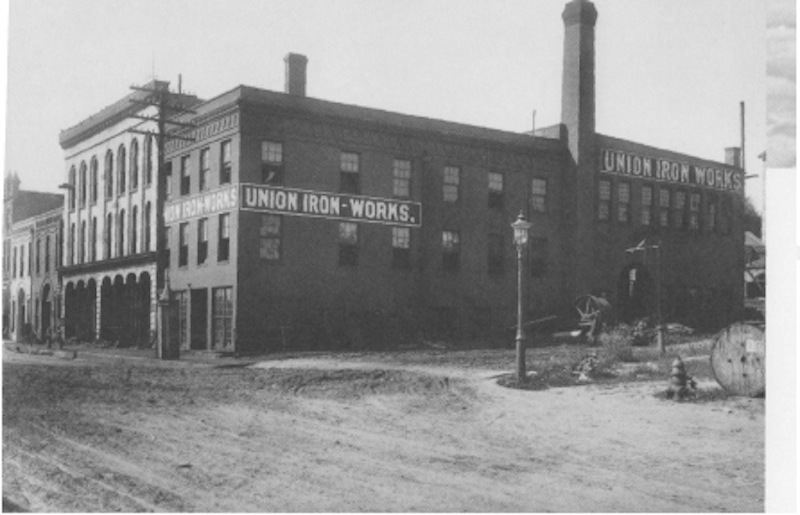 Rufus Porter Upton and his brother Moses, natives of Maine, built the three-story Upton Block in 1855. 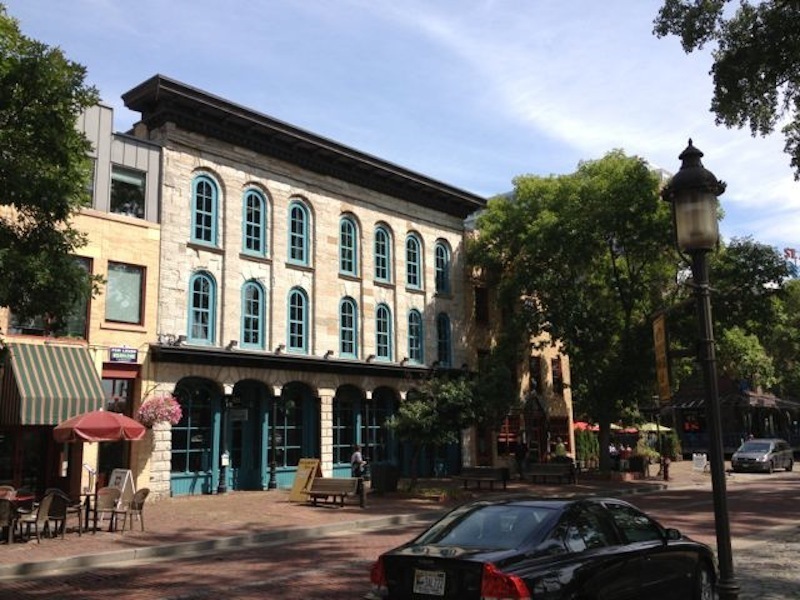 Constructed of yellow Minneapolis brick, the handsome building was designed by Benjamin Cutter, whose 1856 Gothic Revival-style house stands at the corner of 4th Street SE and 10th Avenue SE. 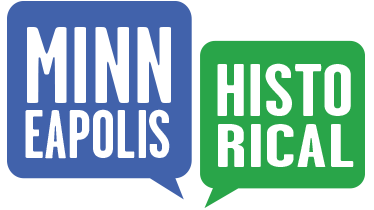 Marcy-Holmes Neighborhood Association, “Main Street Buildings (1855, 1858 and 1890),” Minneapolis Historical, accessed April 22, 2019, http://minneapolishistorical.org/items/show/93.